A snaking coastline and quaint, sleepy fishing villages characterize Amed, a stretch of shorefront with seven villages in Bali's east. Virtually undeveloped until recently, with unpaved roads and no telephone service, the area has quickly transformed from a backwater into a popular destination for holidaymakers. However, despite the influx of tourism, Amed still retains its rural charm. 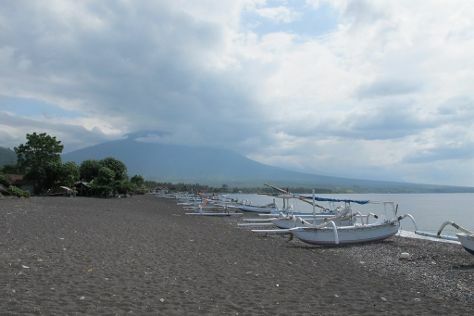 The area offers a diverse range of beaches across its 14 km (8.6 mi) coastline, with the black volcanic sands of Amed town beach in the north standing in contrast to the lighter, softer sands of the southern villages. Its semi-arid climate reflects on the landscape. Amed is in Abang. Plan your holiday in Amed and other destinations, from the rural, to the urban, and everything in between, using our Indonesia holiday planning app . With limited access to television and no guarantee of Wi-Fi or the personal touch of village hospitality, many accommodations in Amed feel like stepping back in time. However, the recent boom in tourism has also brought with it the luxury beach resorts and Western-owned hotels better known in other areas of Bali. For the latter, aim for Amed or Tulamben townships, in the north of the region and close to the wreck of the USS Liberty. If you're after something more authentic, try the quieter villages farther south.